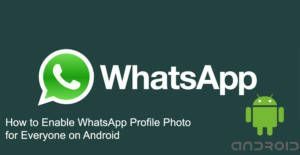 If you would like to share your profile picture to everyone on WhatsApp Messenger on your Android phone or tablet, this guide will help you about that. With this option everyone (+ people who are not in your contacts) will able to reach your picture. If you don’t worry about the privacy of your picture, you will find the all steps at the next paragraph. If you would like to hide your picture on WhatsApp, you will also find a guide about that on How to Chat Online: How to Show My WhatsApp Profile Picture to Only Contacts (These steps are for iPhone but you can do the similar steps on Android devices too) Let’s give all these steps for allow everyone to see your profile picture. See Also: How Long Do WhatsApp Bans Last? Is it Permanent or Temporary? 3-) Tap settings on the menu which will appear after you tap on three dots. 4-) Tap Account on the settings menu. 5-) Tap Privacy on account menu. 6-) Tap Profile Photo and a new screen will appear on the page with three selections. Tap “Everyone”. These are all you need to do for enable profile picture for everyone. A random person who has your phone (somehow) will able to see your picture and he/she will able to download it to his/her phone or tablet. This can be quite annoying for the privacy. However if you think that it is not a serious problem for you, you can always have this option on WhatsApp messenger. You can check how to allow everyone to see your profile picture at the steps above. If you have any questions regarding this subject, you can comment this page or you can leave a question in our Q&A service..
Hello, my contacts cannot see my picture on WhatsApp? What is the reason of this? How can I fix that? Thanks for any solution. Thanks for you for contacting How to Chat Online Questions and Answers service. There is not any known issue with profile pictures on WhatsApp. We believe that your issue is about your privacy settings. Maybe you have changed your settings unknowingly. However you haven’t told what device you are using. So we will provide information for Android and iOS devices on this page. If you are using any other device, please let us know. We are going to provide help about that. That is all you need to do for allowing others to see your profile picture on WhatsApp Messenger. If you have any other questions, feel free to ask us.